ZTE VR uncannily looks and performs like the Samsung Gear VR, and with the 2K display of the Axon 7, it provides a proper virtual reality experience next to the 1080p Huawei VR that's almost a clone. Even before I set my eyes on (and inside) the ZTE VR headset this week, I knew it was coming. It's an obvious pairing with the new ZTE Axon 7 phone. The popularity of virtual reality in 2016 made it a sure thing and it was also a non-surprise to see that it looks almost exactly like the Samsung Gear VR headset. The Chinese phone maker is doing exactly what Huawei did a month ago: launching an likely inexpensive headset to rival Samsung and drive phone sales among early adopters of tech. 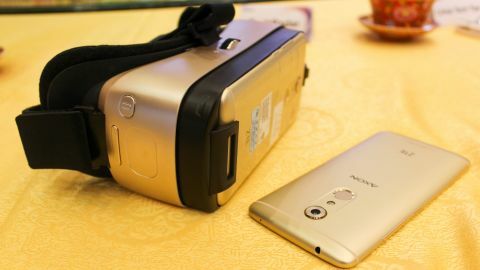 The ZTE VR doesn't look too different from the Huawei VR headset, but there's a little more to its capabilities thanks to the ZTE Axon 7 and it's 2K display. Here's how it performed. Testing the ZTE VR halfway around the world in Beijing was a cinch. It looks and works exactly like anyone with a day's worth of modern day virtual reality experience would expect. The headset doesn't just take cues from the Samsung Gear VR, it reverse engineers the design with an identical layout and size. The gold color is pretty much the only difference. It measures 185.3 x 85.3 x 76.7mm and, without a ZTE Axon 7 installed, it weighs 255g. It won't weigh down your head like the more sophisticated standalone HTC Vive and Oculus Rift. ZTE VR is made out of lightweight plastic on the outside and a soft spongy material where the headset and aspherical lenses met my face. It was comfortable to wear during my demo. Adjustable straps went around my noggin in three directions providing a secure fit with a little bit of tightening. The belt is made of artificial leather and diving cloth, according to ZTE. There's a big difference between ZTE VR and the Huawei VR headset I tested a month ago: the phone that powers the virtual reality experience. The ZTE Axon 7 is a more pixel-dense phone with a 2K AMOLED display, and up close, it easily outclasses the 1080p panel found inside the Huawei P9 and P9 Plus. Quad HD displays like this don't matter as much when you're holding a phone in your hand, and generally I find them to burn through my precious battery life faster. However, when a screen is sitting about two inches from your eyeballs and you're goal is to be sucked into a surreal, virtual reality experience, that pixel per inch count finally starts to matter. Huawei can easily catch up with its next phones, likely the Huawei Mate 9 later this year and the Huawei P10 next year, but it's a bit behind compated to what ZTE is doing right now. The ZTE VR headset also has a 96 degree field of vision and built-in 9-axis gyro sensor so that when you spin your head around in any direction, the screen moves fluidly. ZTE is promising specs on the same level of the Gear VR, but there's a lot of work to be done to match Samsung's Oculus-backed VR game and app content. There may be an answer: ZTE is poised to become one of the first VR headset manufacturers to be compatible with the Google Daydream VR platform announced at Google IO 2016. It's been future-proofed to meet Google's virtual reality specifications, and it basically just needs the ZTE Axon 7 to run the specific Android N update that flips the switch on Daydream. In the meantime, there is homegrown VR content. I ran through a couple of ZTE VR demos at the company's Axon 7 launch event and found the headset to work as you'd expect. There are 360 degree theater experiences that let me watch 2D movies in a virtual theater and, more interestingly, simple VR games that had me flying around and steering with the headset. There was no ZTE VR gamepad demoed, but I did use a built-in touchpad and back button to navigate games and menus. It was second nature having used the Samsung Gear VR. App content provided an early look at what to expect from the ZTE VR headset, though there's a lot to live up to given powerful partnership of Samsung and Oculus for the Gear VR. Google Daydream and its ability to launch a unified platform is going to be what gives ZTE VR a boost - the same goes for other Android-phone-makers-turned-VR-headset-designers. Android N (and a Google-provided VR maintenance update on top of that) is required to make Daydream a reality, and that hopefully also means more frequent updates for the ZTE Axon 7. The ZTE VR headset is the Chinese phone company's answer to the Samsung Gear VR, and it let's new Axon 7 owners experience virtual reality for a cheaper price. The fact that the required smartphone is less expensive makes VR more accessible to a whole new audience. The Huawei VR headset is trying to do the same thing, but its current smartphones are 1080p. The ZTE Axon 7 has a 2K display that really matters when it's right up against your face. It's comfortable and filled with enough sensors. It just has to deliver on content, the big question for me is whether or not Google Daydream can help it do just that in a future Android N update.